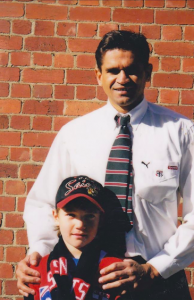 A young Dustin Martin with his hero Nicky Winmar courtesy of Herald Sun. Jennifer Muirden has been a keen St Kilda supporter since 1978 and fondly remembers her childhood Saturdays spent at Linton Street, Moorabbin. In her lifetime she hopes to experience the Saints second Premiership. Great creativity once again, Jen. I think Dusty’s father will have more than a six-pack in his hand (I’m talking a greater quantity of beer here, nothing else) if Richmond get up on Saturday. The photo of St Kilda’s first Saint Nick with Dusty the Kid is a poignant reminder of what could have been for the Saints if youngsters were allowed to play for the team they support. If Dusty does sire a Billy (the) Lid sometime down the track, perhaps the kid will one day play for the Saints (though most money would of course be on the Tigers). Fitzroy Pete, as avid a Saints supporter as I am I would probably be disappointed if any boy Dusty sired played for St.Kilda. For me, Dusty is a proud and loyal Richmond footballer and that heritage would be best to continue down the line. In the very same fashion if one, or both, of Roo’s delightful blonde boys decide to become an AFL footballer he’s got to don the red, white and black! Fully agree, Jen, Dusty has become a Richmond immortal in the past week alone (as have his 21 teammates after the Tigers’ brilliant victory today). I believe Dusty’s recommitment to the club just prior to the finals was a catalyst for the Tigers winning the flag – some good, old-fashioned loyalty instead of chasing the big bucks. Just a shame circumstances were such that his father couldn’t be at today’s game. The Bulldogs’ win last year and Richmond’s success today will surely inspire the Demons and Saints in 2018 in their quest to end 50-year-plus premiership droughts. I am so upset that Dustin Martin who was an avid St Kilda supporter growing up and who idolised Nicky Winmar, did not play for the might saints. Sad but true. Can Jack Steven improve even more and become the next Dustin Martin? I certainly hope so. Do you have any photos of you that you can post as a young girl, similar to Dusty’s age with Nicky Winmar, with you and players like Russell Greene, Trevor Barker and Michael Roberts? I am guessing that’s a picture of you alone as a young girl in the St Kilda jumper?